MediCard, a leading health maintenance organization (HMO) provider, has been given the Reader’s Digest Trusted Brand 2016 Gold award in the Health Card category. Now on its 18th year, the Reader’s Digest Trusted Brands Awards commends products and services most trusted by Filipinos. Brands were chosen by consumers and were rated on the following attributes: trustworthiness and credibility, quality, value, understanding of customer needs, innovation and social responsibility. wellness of their patients,” said Dr. Nicky Montoya, president of MediCard Philippines. MediCard offers services such as preventive health care, hospital confinement, out-patient care, emergency care, members’ financial assistance and dental care. It also has numerous free-standing clinics and satellite clinics nationwide, bringing the best and accessible medical care to its members. To help its patients practice a healthy lifestyle, MediCard also has the MediCard Lifestyle Center which is designed to offer effective solutions for wellness. 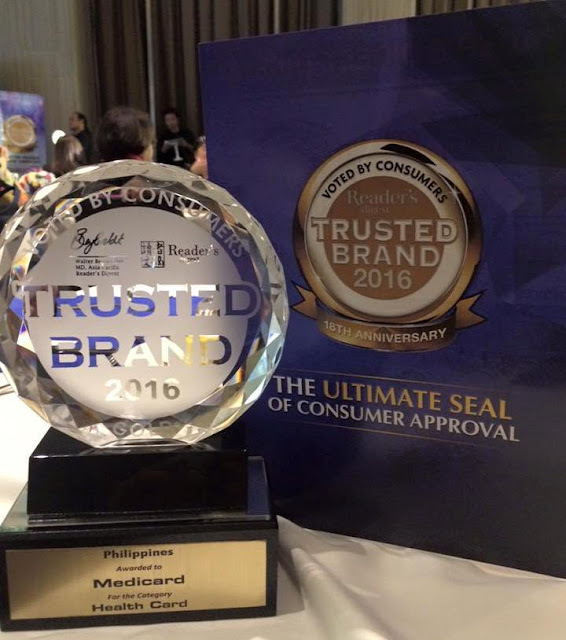 With the Reader’s Digest Trusted Brand 2016 Gold award reinforcing MediCard’s accomplishments, MediCard continues its commitment to bringing trustworthy and excellent healthcare services to Filipinos.